Editing Art - Are Your Paintings Finished? One of the MEA apprentices asked the question, "I was looking at one of my paintings on the wall the other day and had this sense that it wasn't finished! But it's signed ... What should I do?" Art & Energy: Paint With Passion!!! What is Modern Energy Art? Modern Energy Art explained. One of the core features of Modern Energy Art is definitely "the breaking down of the old barriers." Normal people are shockingly disconnected from art - from doing art (you need to be brainwash ... ahem, you need to study first for god alone knows how long before you get to call yourself an artist), to owning original art (that's only for rich/crazy people) and so many others beside. Art & Inspiration: Inspire Me! Energy art essay by Silvia Hartmann explains about: What is inspiration? | Inspiration EVENT | How do you get inspired? | Artist desperately seeking inspiration | Taking control of artistic inspiration | Find artistic inspiration plus a useful artistic inspiration exercise. How "finding your style" as an artist can lead to more freedom, rather than less - and some amazing experiences with the Bonus Paintings. * This might be useful for artists who are struggling to find their "style," so they can "brand their art" better to achieve better sales. 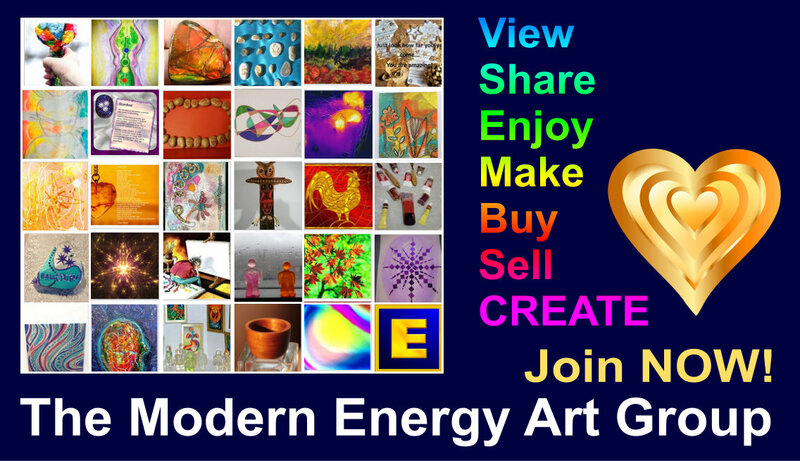 Modern Energy Art Solutions is when the modern energy artist takes charge of their processes of creativity, and uses them to deliberately create a work of art that is the SOLUTION to a problem. This puts the artist in charge of what they want to experience in the process of creating a work of modern energy art. Sheena wrote: "Me and my school are doing this project called 'Passion Project' and we all have different topics and my topic is 'Art and Abuse' so i was wondering if you could give me more information?" What is sacred photography? To answer that question we need to go back a little way, to what happens in a magical photography session between the photographer and their subject. It's been said that abstract art "enables the exploration of yet undiscovered inner territories of the viewer’s brain." I found this article in the archives which describes "The Artist's Prayer" - the artist's contribution to change. This is clearly Art Solutions, not "art therapy as you know it, Jim" where the experience of pain simply gets regurgitated, or the problem/s simply get re-stated, yet again and ad infinitum. I could talk of this for hours; over to the aspect, 2003. Is vector art art ...? I have been unhappy with Ars Gratia Artis for a long time - art for art's sake. WTF is that supposed to mean, anyway? It is at best a step stone to a more grown up understanding of art in the greater scheme of things, both intrapersonally as well as interpersonally. At worst, it becomes a crazy labyrinth that causes havoc for the individuals and societies who adopt this position. I am an artist and an energist. I can get very emotional about my art. Of course, I would. But some of these emotions are indicative of injuries in the energy system, and more than that. Art is for everyone, not just the chosen few who have spent decades learning the secrets of craft in the lofty towres of academia. To make meaningful art, you need passion and an understanding how to translate what you want to share with the world into material objects. Here is a set of very modern energy art exercises to get you started with your own True Creative Art. Now here's an interesting thing. How much do you love your own art? Honestly now. I know we have been entrained, brainwashed, "to be our own worst critic" on the grounds that this will make you into a better person as you berate yourself endlessly, search for all things imperfect and beat yourself up for any little shortcoming. I think that's completely appalling and in fact, a path straight into the abyss of failure - and not just for art, but for life.